That’s what I would describe my favourite chocolate as, Ferrero Rocher. Its crunchy and creamy, with the right amount of sweetness. Nuts are this month’s theme for Click. 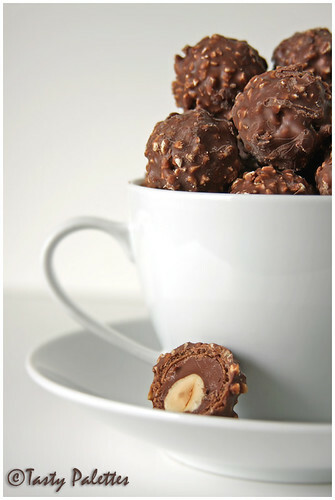 I thought, what better way to appreciate nuts than to dip them in chocolate. And that is exactly what Ferrero Rocher is. A hazelnut surrounded by chocolate cream, encapsulated in a crisp wafer sprinkled with chopped hazelnuts. It is one of those rare occasions that I get to photograph to my heart’s content, without worrying about the results. That’s right, the lovely duo at Jugalbandi have honoured me by inviting to the judges panel. If you haven’t clicked your winning shot yet, hurry, you have only a week left. For some reason, certain food photographs that I have seen in other blogs, magazines or cookbooks gets stuck in my head like glue, until I try it out at least once. This recipe is inspired from one such photo. 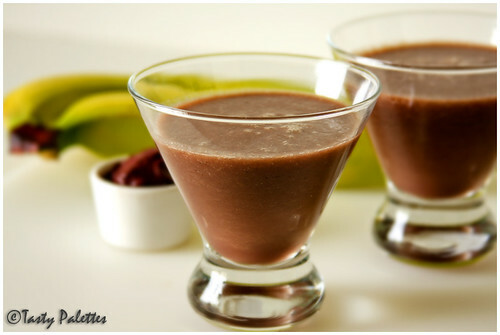 An adult chocolate creme that looks and tastes divine. What I liked the most about this dessert is, its neither thick like a pudding nor thin like a drink, but somewhere in between. 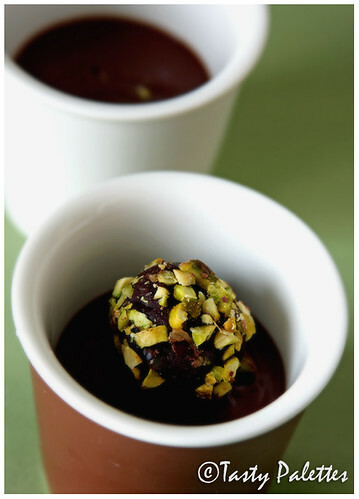 As a true chocolate lover, I served this velvety dessert with home made chocolate truffles. Overall, this dessert is elegant and easy. Prepare the chocolate crème and truffles 2 days before, refrigerate them separately, bring 'em to room temperature and serve your guests. Now that’s easy entertaining. As always, I like chocolate slightly bitter and so I have used dark chocolate. But feel free to use semi-sweet chocolate. Also, I noticed that when refrigerated for more than 3 days, the chocolate crème thickens like a pudding. Not that it alters the taste anyway. So serve this at room temperature or slightly warm. 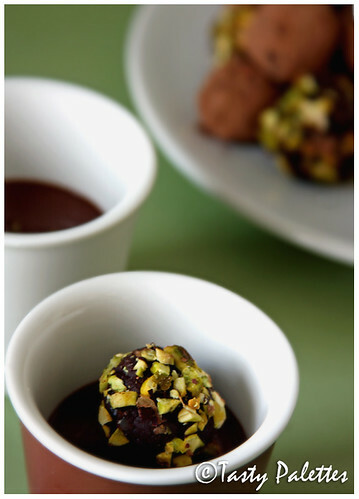 Likewise, refrigerate the truffles and serve at room temperature. 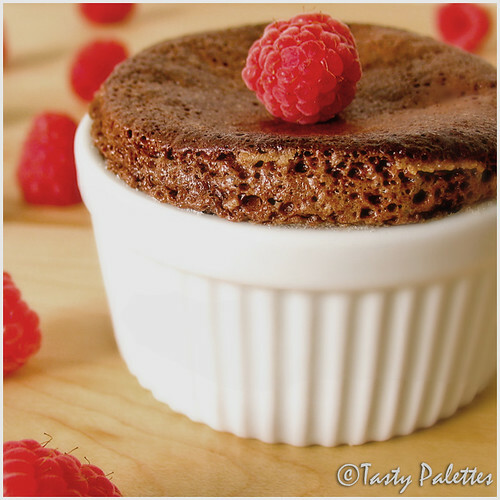 This dessert is so easy that everything is put together using microwave oven. Adjust the cooking times to suit your microwave. 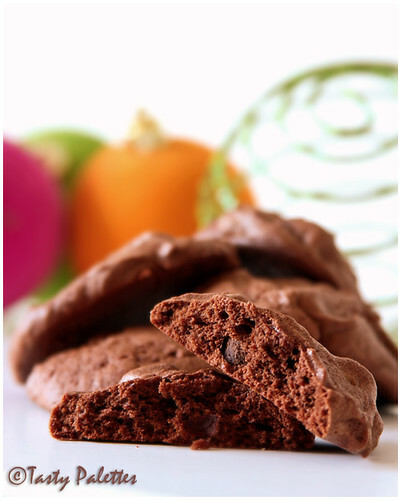 Since chocolate is the star of this dessert, try using the best available quality chocolate. This quite fits Stephanie of Happy Sorceress’ theme and I am sending my Chocolate Creme with Truffles to her Blog Party – Another Bite of Dessert. This is also my entry to My Favorite Things - Chocolate, hosted by Bindiya of In Love With Food. Later, I found adding a pinch of chilli powder/cayenne pepper to chocolate crème instead of liquor was over-the-top. 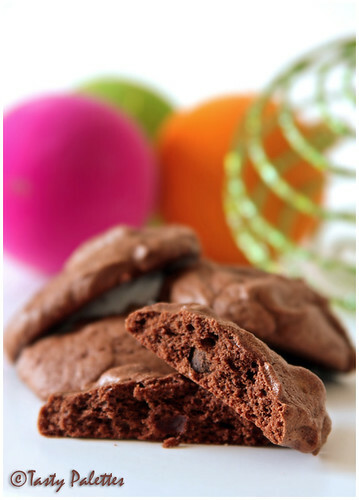 After the initial sweetness of the chocolate, the chilli powder leaves a slight heat on the back of the throat. 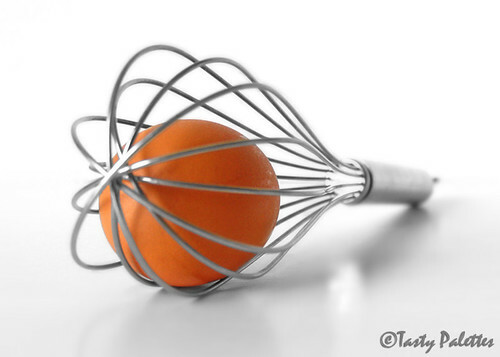 If you don’t want to use egg yolk, use 1 tsp of corn flour in ¼ of water. Adding a tsp of butter to the crème will give it a silkier texture. I omitted it because between the heavy cream and the egg yolk, I felt there is enough calories already. USDA advises consuming about 1 cup of berries each day to meet the recommended antioxidants daily intake. Reducing free radicals, slowing down cell-aging, reducing the risk of cancer are some of the benefits of regular intake of antioxidants. Hence I make sure I include ‘em in my diet. A handful of fresh or frozen berries in my fruit smoothie everyday takes care of it. Recently, I discovered a new kind of berry - Acai (pronounced Aa-sa-yee). What made it notable was its endless list of benefits. 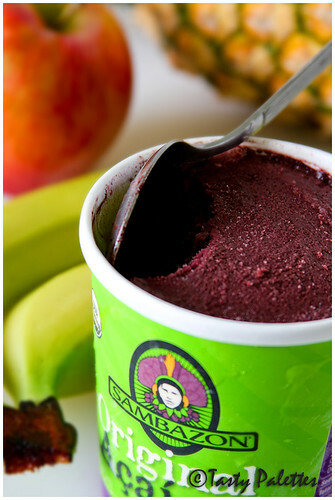 Acai falls into the category of superfood. These are food categories that have significantly high levels of crucial nutrients and are recommended for a better health and quality of life. If I can get that kind of nutrition from nature, without higher calories and side effects, why wouldn’t I? Acai berries are the fruit of Acai palm trees that grow in Amazon swamps and floodplains. Now, you don’t have to go that extent to get hold of these mighty berries. The pulp of these berries are sold frozen or powdered in many supermarkets. You can also find them in packaged smoothies, carbonated drinks, flavoured coconut water etc. I find frozen pulp easier to manage. All I have to do is to scoop a couple of spoons into the blender. But they are little bit on the expensive side when bought in small quantities. Recently, Costco has started carrying Sambazon Original Organic Acai pulp (labeled as sorbet) in three single pint containers. Easy to store, easy to use. Taste wise, as the package states, it is more of a rich berry flavour with hints of chocolate. Acai and bananas are a top class combination. Acai topped with sliced bananas and chopped nuts is my favourite ‘ice cream’ sundae these days. But the real winner is Acai smoothie with banana and few chunks of honeydew melon. You have to taste it to believe it. So I bought these new tartlet pans. Who can resist tarts after seeing Tartelette’s eye-popping creations. I couldn’t wait to create a fabulous tart. But all the recipes for the tart dough called for at least one stick of butter. As if there isn’t enough indulgence already (all in the name of holiday baking), I searched for a low-fat, more-sensible recipe. I landed on Ellie Krieger’s page. I like her recipes from her show Healthy Appetite. Instead of substituting full fat cream cheese with a low-fat one, she talks about portion control and other sensible ways of eating right. I have tried many of her recipes and am happy with every one of ‘em. I used her recipe for making the crust, but made the filling with what I had on hand. The original recipe looks equally good, which I plan to try out some day. As said in the reviews, the crust is a bit dry and crumbly. With more butter, it may be one of those melt-in-your-mouth tarts. But, hey, am happy with the recipe as-is. Also, I have used marinated mushrooms from the olive bar, which already had garlic and red peppers. You may want to add these separately if you are using fresh mushrooms. I have used sun-dried tomato pesto, you can use any pesto you have on hand. This is my first time baking tarts, and the lesson I learnt is, the filling shrinks a little bit after being baked. So its better to slightly overfill them. 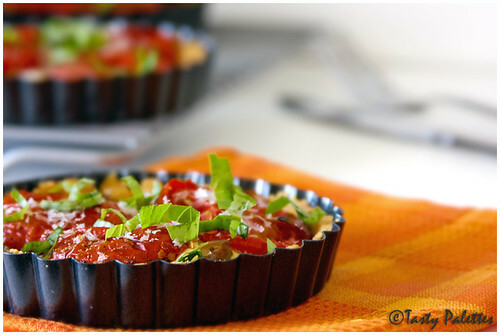 This recipe makes four 4-inch tartlets that serves two. 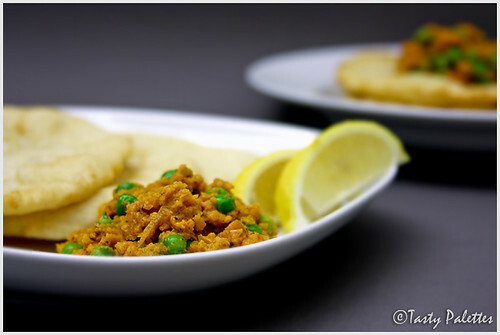 Pulse the first five ingredients in the food processor until the dough form pea sized lumps. Gradually add one tbsp of water at a time and pulse until everything comes together. 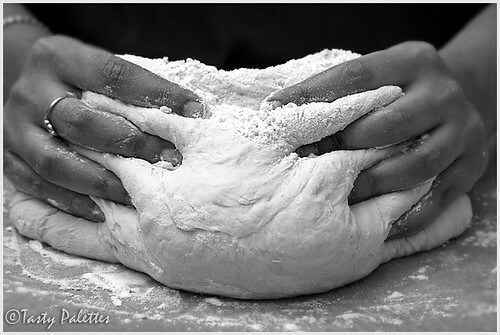 The dough for the crust can also be done by hand. Transfer the dough onto a working surface and knead for 10 seconds. Divide the dough into four equal parts and press each portion onto a 4 inch tart pan. Transfer the tartlet pans onto a baking sheet, prick a few holes on the crust with a fork and bake for 10 minutes at 350F oven. Rotate the baking sheet and bake for additional 5 minutes. Remove and set aside. Meanwhile, prepare the filling by sautéing red onions until brown. Sear any other thinly sliced vegetables, if using, on both sides, seasoned with salt and pepper. Slice the marinated mushrooms along with roasted red pepper and garlic. Shred mozzarella cheese. 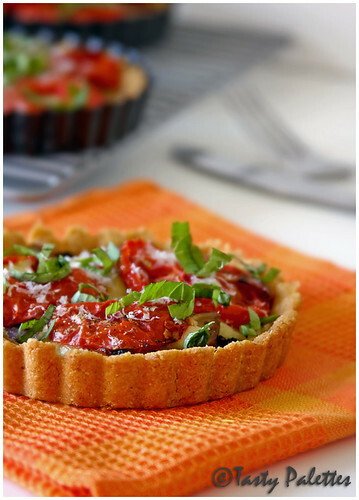 Assemble the tart by brushing a tbsp of pesto at the bottom. Spread caramelized onions, mushrooms, garlic, red peppers, and other vegetables if any, one above the other. Sprinkle shredded mozzarella and/or Boursin. Place tomato slices on the top. Season with salt and pepper and bake at 350F for 20 minutes. Take the tarts out and let it cool for 5 minutes. The edges pull away from the pan as they cool. 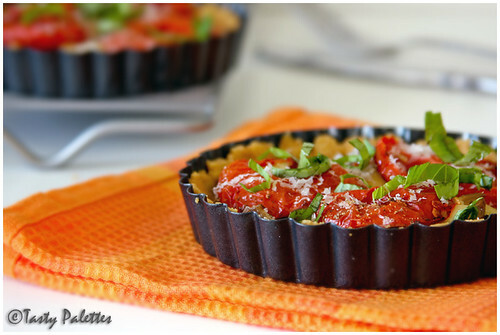 Remove ‘em from the mold, grate parmesan over the tarts and garnish with basil. Serve warm with a side salad or flavoured yogurt. These mini tarts are on their way to The Mini Pie Revolution hosted by Karyn and Ann at The Mini Pie Revolution Headquarters. Ann, Thank you for graciously accepting my tartlets. 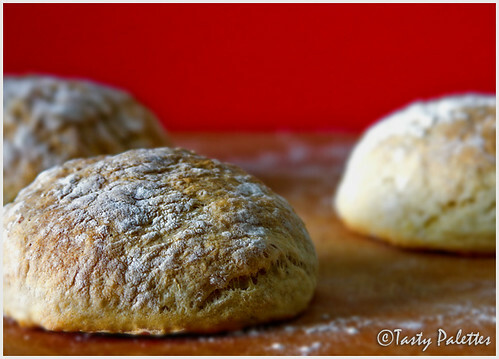 Its raining potato bread everywhere in the blogging world and the temptation was too much. 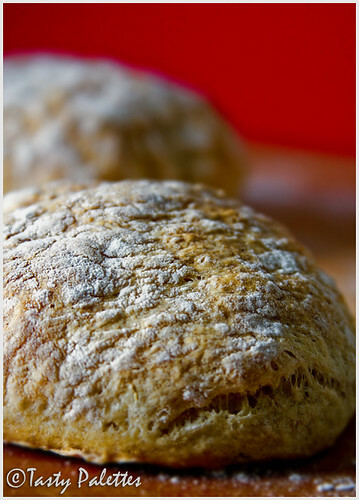 I duly surrendered and set out to make bread from scratch, for the very first time. I have always wanted to try potato buttermilk rolls recipe from this book. So I combined this recipe with Tanna’s recipe and developed my own. The rolls were soft and chewy with a light tang from the yogurt. I am so glad I made ‘em. Served with soup or as a sandwich, potato buttermilk rolls were just right. Peel and dice potatoes and cook in 4 cups of water, until soft. Drain and reserve the cooking water. Mash the potatoes well and let it cool. When the potatoes are warm and not hot, combine with yogurt, 1 ½ cups of potato water, yeast. Leave for 5 minutes. Add sugar, salt, butter, whole wheat flour and 2 cups of all purpose flour to the potato mixture. Mix well until combined. The dough will be very sticky. Turn it on to the counter and start kneading. Keep adding flour until the dough comes together, about 2 cups. Transfer the dough to a well oiled clean bowl. Cover and let rise for about an hour. When doubled in size, punch the dough and knead again. 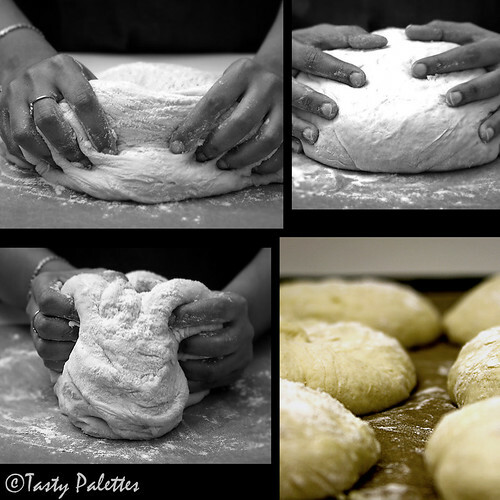 Divide the dough into two and reserve one half. Shape the other half into 6 rolls onto a baking sheet, lined with parchment paper. Cover and let rise for about 25 minutes. Preheat the oven at 450F. Lightly flour the rolls and bake for 10 minutes. Reduce the oven temperature to 350F and bake for additional 20 minutes, until light brown. Cool on a wire rack. After the dough was done, I feared that it may be too much for just the two of us. I reserved half of it and chose to worry about it later. When the later came and I still had no idea I was a little desperate. Then an idea struck. Anjali of Anna Parabrahma had left a comment on this post, saying that she once made bhature with bread dough. Considering that the ingredients for the rolls were almost the same as aloo bhatura (barring yeast), I decided to give it a try. The bhature were a huge hit. The leftovers were even better. With due credits to Anjali, here is the method for making bhature. Take the other half, and add equal amount of all-purpose flour. Knead well. Roll out thin small rounds and deep fry. Serve with your favourite curry. I served mine with Ashwini’s Gobi ka kheema. I have been looking for this recipe for quite some time and this one is spot on. 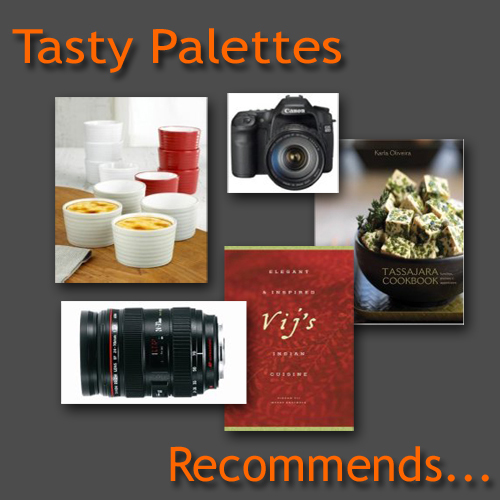 Ashwini, your recipe pleased our palettes just like your pictures delights our eyes. Phew! Hosting an event is not a simple task. This being the first time, I learnt quite a bit. I was also introduced to many blogs and bloggers. On the whole, it was a fantastic ride from the start, thanks to you all. I was hesitant about announcing Vegan Ventures, not sure how it will be received. But gracious bloggers, as you are, played along well to make this event a success. 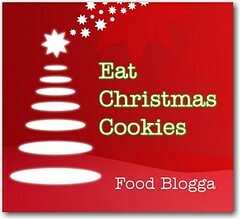 Bloggers from varying food groups participated with equal enthusiasm. And some of you (Asha, Siri, Sea, Nags, Meera, The Cooker, Sarah, Sia, Mansi, Rina, Latha & Lakshmi) even sent two entries each. A big ‘Thank You’ to all the participants for sending in a total of 56 entries. Although we (myself and ‘G’) have been vegetarians all our life, the concept of Veganism is quite new to both of us. Up until recent times, we always had thought being Vegan was just about not consuming any dairy, meat or any animal based products. Boy were we wrong. 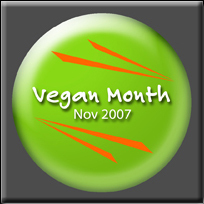 Veganism is a lifestyle, a choice, a pledge to live free of cruelty to other living organisms that inhabit this planet and to live in harmony with nature. The concept of Veganism does not stop at the table, but extends to every other aspect of our modern lifestyle ranging from cosmetics, medicines etc. Using products that are not tested on animals and those which are not harmful to the environment. In today’s age, it may not be entirely possible to live 100% free of cruelty. Knowingly or unknowingly we all consume a variety of animal based or derived products. Accepting this fact and increasing our awareness lets us do the best we can. I hope that Vegan Ventures in its own small way, has contributed to spreading this awareness. It was also an opportunity for us to expand our knowledge and awareness of this unique lifestyle. For further reads follow these links – Living cruelty free, Factory farming, Vegan Society. 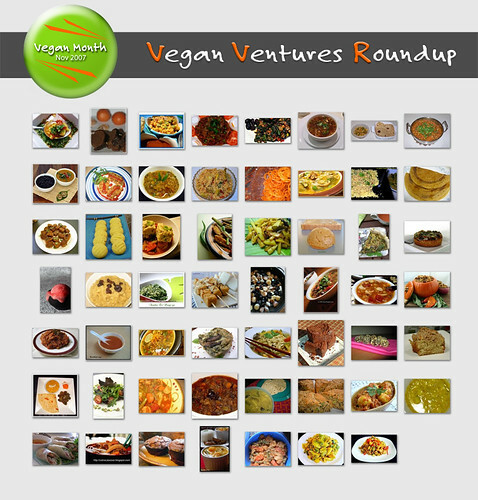 With that thought, I leave you with a gorgeous array of vegan recipes, each unique and different, as their creators. In addition to the 56 entries I received, you can find 8 of my entries too. The picture below will take you to the gallery. The entries are in the order in which I received them. If you don’t find your entry or is there a correction to be made, please let me know, I will rectify it. For quick reference, the event logo on the left pane will bring you to this roundup on your future visits.